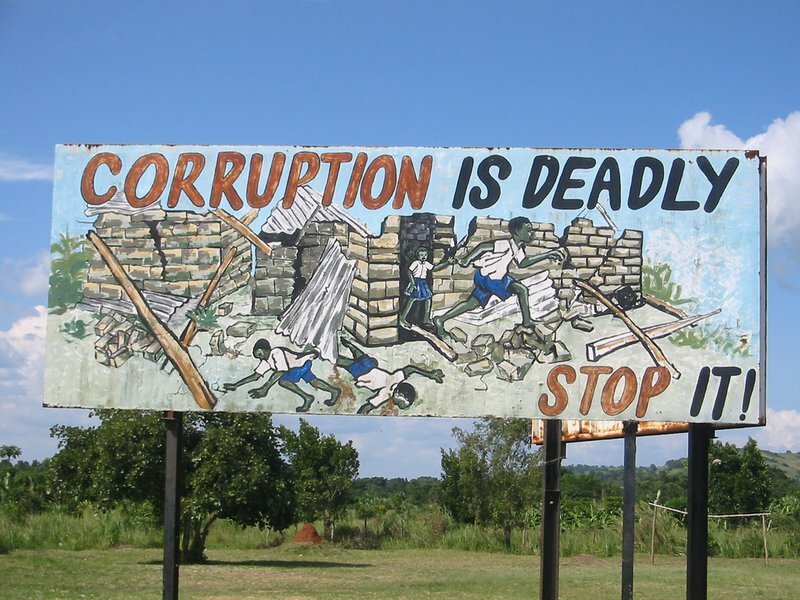 Anti-corruption sign in Uganda. Credit: Flickr/FutureAtlas. CC-BY-2.0. After all, there have been plenty of aid scandals in the past, but instead of helping donor publics to develop a better grasp of the challenges involved they’ve reinforced a survival logic that focuses on quick wins instead of longer-term institutional, economic and social transformation. Take the case of Ireland in 2012, for example, when Irish Aid suspended its entire assistance programme in Uganda after it was revealed that four million Euros that were destined to help rebuild the country’s war-torn northern region had been siphoned off to a personal account by the Office of the Prime Minister. The Tánaiste—Ireland’s Deputy Prime Minister and the Minister for Foreign Affairs in charge of Irish Aid—was reportedly ‘absolutely disgusted’ by the revelation, which was followed by a sudden burst of op-eds and public debates not unlike those surrounding the current #Aidtoo moment. Then, in January of 2013, the Ugandan government repaid the misappropriated funds, and by 2014 Irish aid was once again flowing into the country. As public attention moved on, aid professionals got on with business more or less as usual. The disconnect between the public outcry in Dublin and the pragmatism on display in Kampala might seem jarring. But when one takes a critical look at public conversations about foreign aid it quickly becomes evident that they hardly ever concern development at all: most of the time they revolve around money, and sometimes around partisan competition that itself breeds disinformation. In the United States in 2013, for example, the Pew Research Center asked which federal government programmes the public would increase, decrease, or maintain at the same level. Of the nineteen categories surveyed, foreign aid had the biggest partisan gap, with 45 per cent more Republicans than Democrats supporting a decrease; the gap was wider than for high-profile, controversial issues such as unemployment benefits and public healthcare. This hyper-partisanship probably explains the widespread misperception among American voters about the size of the US aid budget, which they estimated as 26 per cent of the total federal budget in a 2015 survey. The actual figure is ten times smaller. Such misperceptions are possible because most people know remarkably little about what foreign aid actually does. Processes of development in Africa or Asia are as contentious as in Europe or the USA. Change takes time and needs activist reformers, people willing to challenge the status quo in order to build something different. Take Valentine Collier, for example, an old-school civil servant in Sierra Leone who shook up the country’s post-war politics when he became anticorruption commissioner in 2000 and, against all the odds, decided to take the job seriously—to the point of investigating sitting ministers and embracing an open confrontation between his office and that of the president who appointed him. Collier was ultimately let go, but not before raising the political profile of corruption as an issue and thereby ensuring that the next government strengthened the anti-corruption regime. In cases like these, reformers were able to wage dangerous political battles in part because they had support from external partners and resources from foreign aid. Morlu was recruited and his office supported by the European Union, granting him financial autonomy and a modicum of political cover that were rare in a politicized public sector, but essential for the job of Auditor General. Collier was supported by a British deputy, and his Anti-Corruption Commission supported financially by the United Kingdom. It was the UK, in fact, that mediated between Collier and the Sierra Leonean president when their confrontation escalated, keeping him active until the political pressure became unbearable. Taxpayers in donor countries are unlikely to read such stories in the media, or even in reports produced by NGOs and other donor agencies themselves. Instead, they are treated to simplistic stories of how their Pounds and Dollars are saving children, or shallow polemics supporting one end of the political spectrum or the other, though they are particularly common in certain corners of the conservative movement. For example, in 2016 Britain’s Secretary of State for International Development at the time (Priti Patel) declared that ‘British aid is being wasted and stolen’ in the pages of the Daily Mail. Despite the lack of evidence to substantiate such claims, strident rhetoric and simplistic success stories encourage aid agencies to choose quick, technical fixes over support for long-term transformation. Controversial programmes usually close all too quickly, their lessons ignored or silenced in favour of expenditure reports and spreadsheets full of arcane indicators and metrics. Aid is trapped in a process of chasing quick wins which reinforce the message that development is easy, ignoring “a central principle of development theory that those development programmes that are most precisely and easily measured are the least transformational, and those programmes that are the most transformational are the least measured,” in the words of former USAID Administrator Andrew Natsios. The examples of Collier in Sierra Leone and Morlu in Liberia could easily feed conventional anti-aid crit­iques: after all, neither project worked as intended and money was wasted, end of story. But this is a myopic reading of the evidence. What aid achieved in both countries may not have looked like much of an achievement according to reductive, quantitative indicators, but it helped to launch and sustain episodes of institutional reform, social mobilisation and political accountability that prompted a re-examination of political norms and development objectives. In the process aid helped to empower local actors by providing funds and skills that encouraged them to continue fighting (even after the donors left) as part of a broader process that de-legitimised corrupt incumbents and, in some instances, helped to topple presidents who preyed on their own countries. External support gave reformers more hope and more capacity to turn it into concrete action. The problem with current aid debates is that they ignore or demean the work of Collier, Morlu and thousands of other people who risk their careers, reputations, and in some cases even their livelihoods to achieve the kinds of transformations that could make their states more effective, their politics more democratic, and their economies more vibrant. They challenge power and get beaten down for it. It is not their fault that their struggles don’t fit the technocratic, short-term, results-oriented frameworks of the aid industry or the superficial rhetoric of partisan politics. Reformers will continue to do the messier jobs of devel­opment long after donors lose patience or shift their atten­tion to the next crisis of the day. It is bad enough that aid usually offers them such lukewarm support in their battles; but even worse when their work is sacrificed at the altar of quantifiable evidence or supplanted by white saviour stories sold by NGOs to the public. Foreign aid is not a good investment: the risks are generally high and the dividends far too uncertain. No wonder many people in donor countries think it’s a waste of money. At the same time, aid is exactly the right kind of investment to make when it is patient, hands-off and sensitively applied. It can play a crucial role in development by supporting reformers who choose to pursue the greater good against sometimes insurmountable odds. This is a role that’s consistent with the experience of social, economic and political transformation in donor countries, and which is compatible with basic human values beyond partisan divides. However, it is also a role that requires a fundamental revision of how we think, speak, and debate about aid at home and internationally, moving beyond the idea of a transaction—‘one pound in exchange for one educated child’—in order to acknowledge the messy and conflicted realities of social transformation.